The attractive and functional kitchen includes a refrigerator, freezer, stove, oven, dishwasher and a charming "coffee bar" where you can enjoy a morning cappuccino. 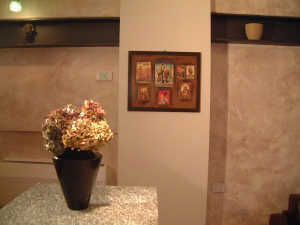 If you like to cook, you will find it to be equipped with great attention to detail including an elegant service for 6. 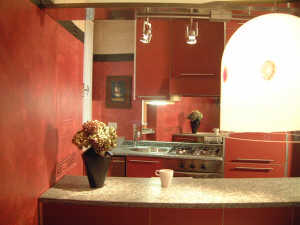 The kitchen also comes with "mini bar" selections including Italian wine and mineral water. For an extra charge, we will be happy to stock the kitchen to your specifications. Be sure to make your requests along with your reservation. 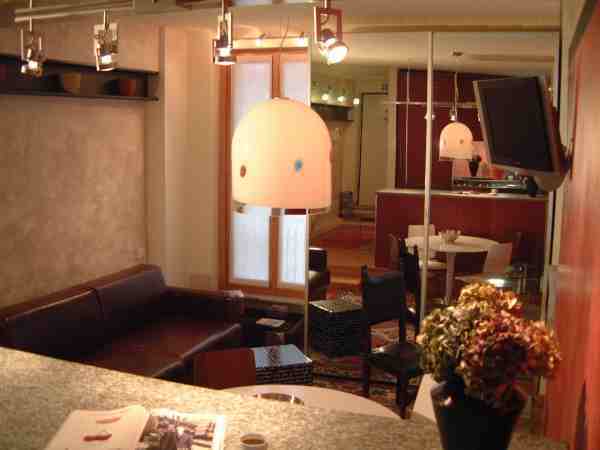 The tasteful interior of SunRe8 is a fitting reflection of Milan, the design capital of the world. Touches of antiquity harmonize with modern pieces for an effect that is both warm and upscale. 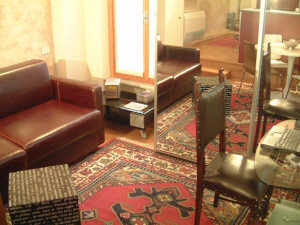 The space includes a dining area and sunny sitting room with sofa that converts into a luxuriously comfortable bed. This corner studio features 3 windows that look onto private gardens within a walled courtyard. The windows are double-glazed with heavy outer shutters for dark and quiet nights. 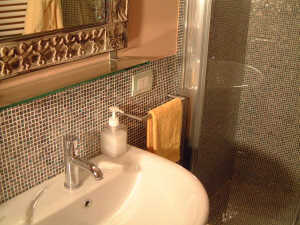 The bathroom is elegantly tiled in glass mosaic and features a shower, bidet, sink, toilet and luxury extras including a wall-mounted towel-warmer and fluffy cotton bathrobes.